You have all these photos in your hard drive – wedding photos, birthday photos, graduation photos and travel photos. They could easily be the most priceless possession you have. While digital technology has made storing and organizing these photos as easy as ABC, they could also be easily wiped out if your hard drive is corrupted or lost. 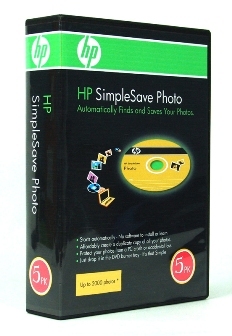 Hewlett-Packard’s SimpleSave Photo provides an extremely simple and convenient way to backup these photos. Priced at $15, HP SimpleSave Photo retails in a pack of five DVDs. You don’t have to install any software to run the application. The SimpleSave software component in the DVDs launches automatically. You only have to insert the disc into the DVD burner to activate the duplication process. The application recognizes more than 100 file formats on your PC including RAW camera files and video clips. However you can choose to include or exclude any files from the backup process such as photos in email, Zip files, etc. The application will notify you of the total size of your files and the number of DVDs required. You only have to replace the DVD with another blank one when prompted by the message which appears during the burning process. • Initially, users will see a “loading” message upon inserting the DVD. • Soon, a “Welcome… starting in 15 seconds” message will appear. • Next, the user is shown a summary of what photos have been found, the number and size of the files, and the number of DVDs required. The user can select which photos they want to include in the backup. The finished backup DVD includes a thumbnail viewer for browsing as well as options to print or share the photos with friends via email. The application maintains the folder structure and organization of your photo and video files when it duplicates them do that there are no changes even when you view the backup DVDs on another PC. This application is compatible with Windows Vista, XP and 2000. It is very useful if you have lots of photos and don’t have time to copy or burn them one by one. However, it does not allow incremental backups but only a snapshot copy of one’s files. For professionals with a large photo collection, the new HP MediaSmart Server is the better option.